Monthly Mug Mats Club 2018/65% discount! Machine Embroidery > Monthly Mug Mats Club > Monthly Mug Mats Club 2018/65% discount! A machine embroidery applique club featuring Patrick's popular mug mat, hot pad and trivet designs. See previous years' designs here. Retail price for the collection of all 12 designs is 119.88 - more than 60% off the retail price of the individual designs. 12 months of designs - June 2018 through May 2019! Join at any time through May of 2019 and receive all of this year's previous designs, too. For example, if you wait until August to join, you'll also receive the June and July 2018 designs upon joining. If you have questions, feel free to email gary@patricklose.com or call 623-414-9464. See previous years' designs here. One round and one square/rectangle coordinating mat designs will be delivered each month. You must have a hoop in which a 7.75 x 7.75" design can be stitched. Great for mug mats, candle mats, hot pads and trivets. These are all NEW designs! Before adding this product to your cart, you'll be asked to click the box, above, signifying that you have read and understand the rules and information provided, below. If you can't agree to these terms, we won't be able to process your membership. Your club materials will be delivered to the email address provided to us by PayPal upon checkout. Certain email providers block or "blacklist" emails with active hyperlinks or attachments like the ones you will receive from us with your download links. Yahoo and AOL email addresses are almost always a problem. Please be prepared to offer an alternate email address if we have problems delivering the materials to you. Thanks for understanding. 1. You are familiar with machine embroidery designs by Patrick Lose either from previous purchase and use or you have taken a look at the designs at PatrickLose.com. 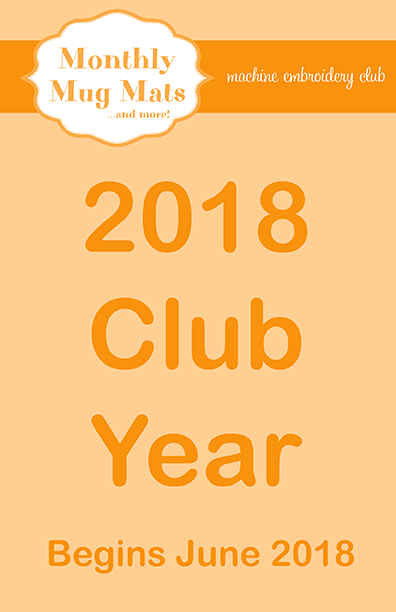 Each month's designs are in the same style as the ones currently offered on the website and you understand that the club's offerings will be themed by the month, season or holidays for which they are designed. 2. On or before the last day of each month, you'll receive an email with the month's files attached for downloading. These files will include the digitized embroidery files, a photo of the completed project and a Stitching Master PDF file which will show the stitching order. Please be sure you have the latest version of Adobe Reader. Download link will remain active for 30 days and you must download your files within the 30 days after receiving the link. 3. You must have a large hoop to be able to stitch and quilt these designs in the hoop. The round mats are 7.75" diameter and the square ones are 7.75 x 7.75". 4. You must have a knowledge of how to download and use the digitized embroidery files in your machine. You will download the files to an external drive and create a back up of all stored designs. It is your responsibility to store the designs in a safe place as we are not responsible for replacing the designs once you have downloaded them. Our analytics software tells us when you have received and downloaded the designs. You will not try to open them with anything other than your embroidery software or machine. We're happy to help if you have problem, but this is a simple process and if you have problems or questions you may also need to contact your machine dealer. We're happy to offer tips on how we embroider but we do not offer instruction with the designs and, again, your machine dealer is usually the best source for this. Important: Please "like" Machine Embroidery by Patrick Lose on Facebook. This will be a good source of information about the club and all of our other machine embroidery offerings. We've created a photo tutorial with details on how we create our in-the-hoop mini mats. If you'd like to take a look, you'll find it here, free of charge.